One-third of children in Washington arrive in kindergarten without the language and literacy skills they need. AS pediatric health-care providers, one of the most powerful tools we can pull out during exams is not a piece of medical equipment, but a book. Investments in a child’s earliest months and years offer the best chance for all children to succeed in life, but not every child has the same access to those investments. Washington state has been missing opportunities to ensure every child goes to school ready to learn. We have 23,000 children who are eligible for the state’s Early Childhood Education and Assistance Program (ECEAP) but cannot attend because the state has not funded enough slots to serve all of those who qualify. Amanda Jacobsen, a physician and pediatric resident at Children’s Hospital, is a member of the Washington chapter of the American Academy of Pediatrics. Michael Dudas, chief of pediatrics at Virginia Mason, is president of the Washington chapter. 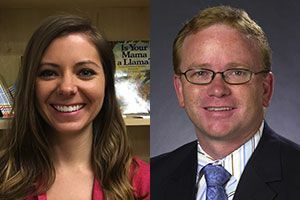 Studies have found dramatic differences in early language exposure of 1- and 2-year-olds in low-income families compared with children in higher-income families. By 3 years of age there is a significant word gap between what children in low-income vs. higher income families hear, and one-third of children in Washington arrive in kindergarten without the language and literacy skills they need. With the current education funding crisis in our state, underserved young children are starting out behind their peers, and then entering an underfunded public-education system. We need to fully fund public schools and preschools. And the evidence is clear that we must also invest in infants and toddlers and their parents. Helping families close that gap in school-readiness is among the most impactful things we can do as pediatricians. The American Academy of Pediatrics (AAP) recommends that pediatric providers promote early literacy development for children beginning in infancy and continuing at least until the age of kindergarten entry. One way to do that is for health-care providers to give families a book at every well-child visit. 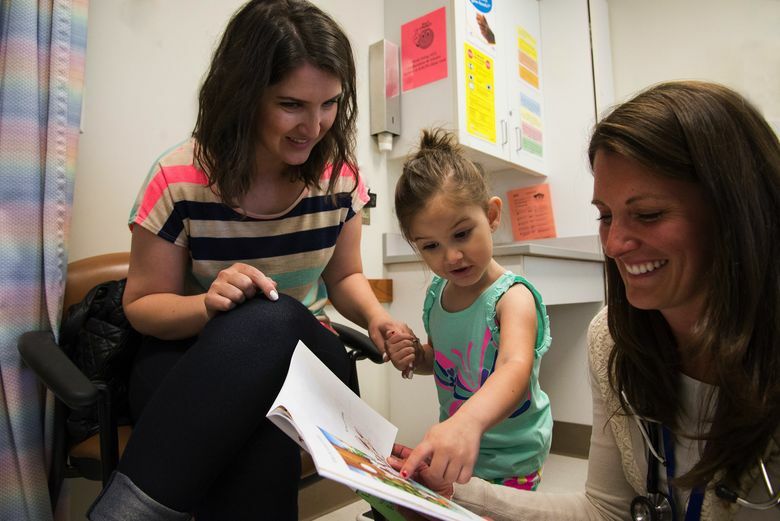 This tool allows us (and thousands of other pediatric health-care providers across Washington state) to make a difference in the development of our youngest community members through a statewide evidence-based early literacy program, Reach Out and Read. Studies show that in populations at risk, families who participate in Reach Out and Read have a more positive attitude toward reading aloud, better parent-child interaction, and signiﬁcant increases in expressive and receptive language in early childhood. There are two purposes for participating in Reach Out and Read. First, as doctors we are trained to use books as tools to assess development of a child, expecting the 1-year-old to chew joyfully on the book and the 5-year-old to sit on the parent’s lap and engage in exploring the book with the parent. We watch for subtle abnormalities in behavior that may warrant further evaluation. Second, the books enable parents to support language and literacy at home and help children develop critical early language and literacy skills that set the stage for reading proficiency. In times of uncertainty about health-care access, any tool that can close gaps in health-care disparities is crucial. Incorporating Reach Out and Read into pediatric and family-practice residency training is a unique opportunity for physicians in training to help close the gap in early learning across our state. Pediatric residents are learning about the importance of early development and early literacy. This creates a special relationship between physicians and families. Residents help families understand the impact they have on their child’s readiness for school, and the importance of talking and reading together. While our country is in a time of turmoil and disagreement, the silver lining is that communities continue to come together to work on programs that have been shown to have a positive impact. Reach Out and Read has been demonstrated to be an effective way to help physicians promote health and early childhood development across cultures. We have an opportunity in our state to invest in programs like Reach Out and Read that pay off over a lifetime.